Women the world over are lamenting George Clooney’s wedding to Amal Alamuddin. We, however, are drooling at the jaw-dropping interiors of both his wedding reception locale and his honeymoon destination. 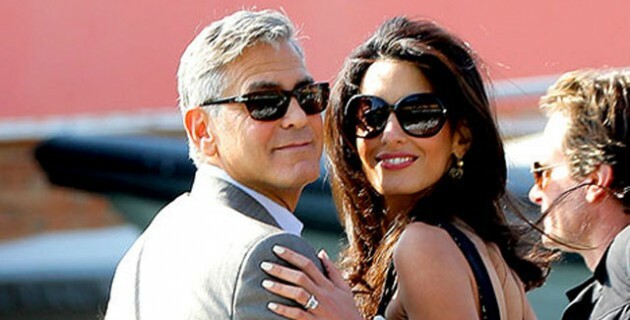 Mr. Clooney, you may be happily married, but we will always love you – and your impeccable taste! George Clooney and Amal Alamuddin were married at a romantic ceremony in Venice, Italy at the luxurious Aman Canal Grande. 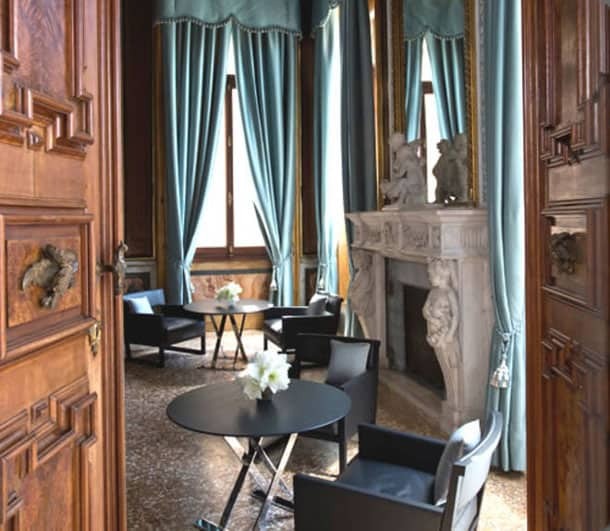 The palazzo where Aman Canal Grande Venice is housed has a rich history, originally built in 1550. Guests arrive by boat, docking at a landing that leads into the Palazzo’s reception hall. The beautiful venue for Clooney’s wedding serves as a prime example of mixing old and new successfully. The stunning classical details in the building’s architecture highlights the historic period that the building was constructed in. The contemporary furnishings in the building are desirable to sophisticated and trendy travelers. The simplistic style of the furnishings allows the buildings architecture to play a starring role. 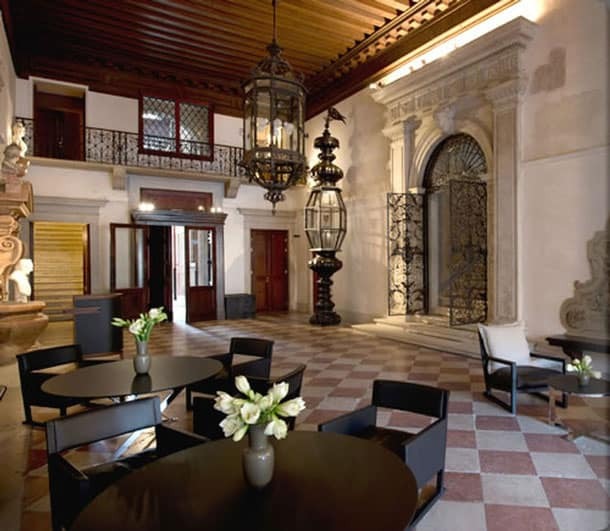 The hotel is graced with soaring ceilings and historic frescos. There are two dining rooms. 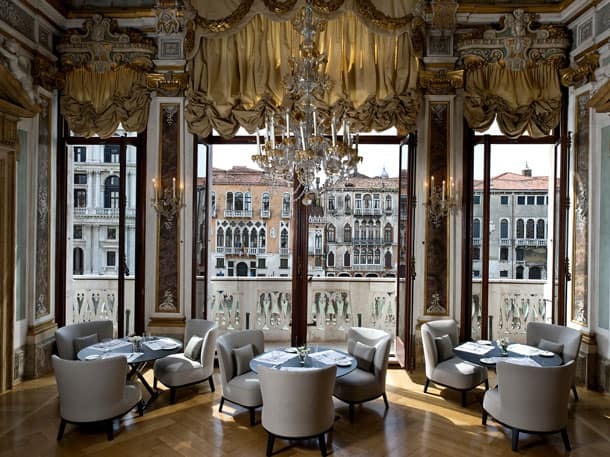 The Yellow Dining Room, featured here, has a ceiling painted by renowned 19th-century artist Cesare Rotta and looks over the Grand Canal. 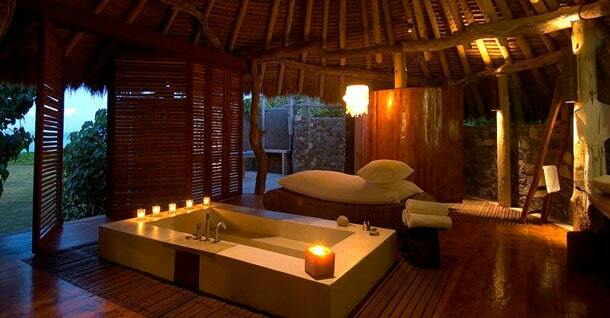 The luxurious hotel has private gardens, a game room, library, spa and salon. 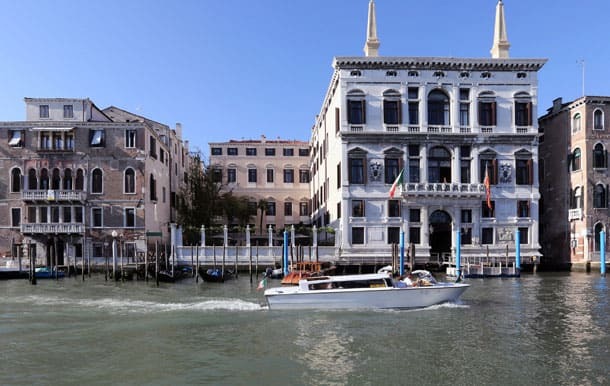 There are only 24 bedrooms, which has reportedly caused wedding guests to stay at the nearby Hotel Cipriani on the island of Giudecca. 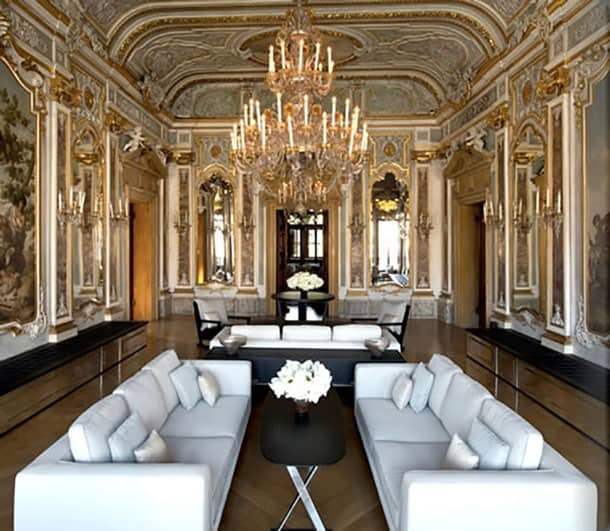 Clooney has history with this historic gem, having stayed at the hotel for years during the Venice Film Festival. He even created some of the hotel’s signature cocktails. 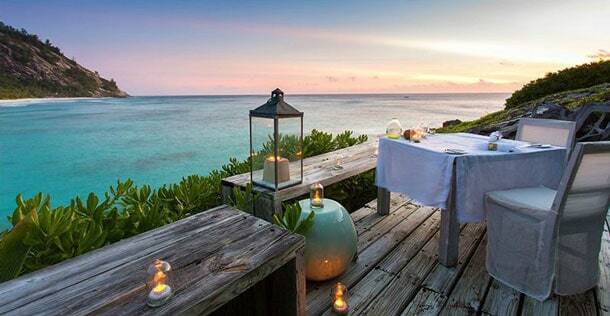 After an elaborate wedding, the newlyweds whisked away to the Seychelles in the Indian Ocean. 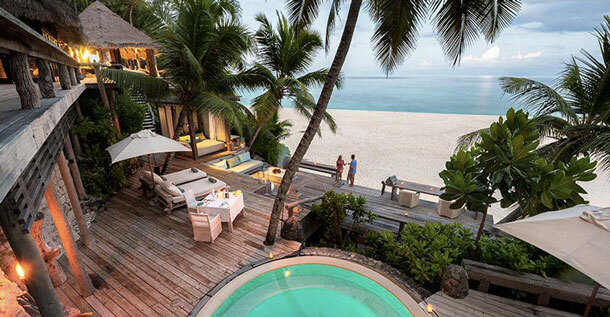 The couple is staying at the luxurious North Island resort. This image from the North Island Resort website depicts a map of the private island, a gemstone in the clear azure of the Indian Ocean. The décor is perfect for blissed out honeymoon lounging; cozy, plush seating is mixed with textural woods and natural materials. The lovebirds are enjoying sunshine and time alone in this impeccably decorated island paradise. The resort seamlessly blends with nature in this tropical hideaway, both in their efforts towards conservation and as reflected in their stylish décor. The resort is so private it can only be accessed by helicopter. 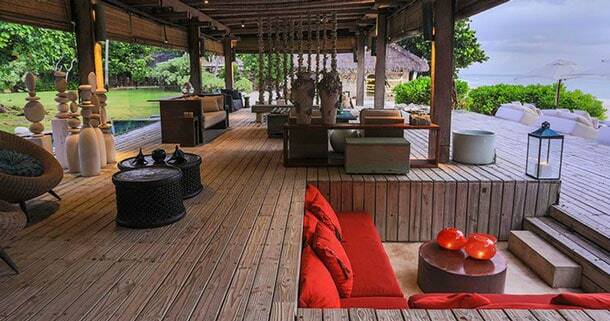 Each villa is exquisitely designed to celebrate nature and harmoniously reflects the tropical ambience. The resort offers in-villa spa treatments providing the ultimate experience in luxury and relaxation in guests’ own private space. As if a private island is not quite far enough from adoring paparazzi, the love-struck couple will enjoy plenty of privacy in their 5000 square foot villa with its own private plunge pool.